1. To Prepare Glasses for Jelly: Wash glasses and put in a kettle of cold water; place on range, and heat water gradually to boiling-point. Remove glasses, and drain. Place glasses while filling on a cloth wrung out of hot water. 2. To Cover Jelly Glasses: Some prefer to cover jelly with melted paraffin, then to adjust covers. 1. Pick over currants, but do not remove stems; wash and drain. Mash a few in the bottom of a preserving kettle, using a wooden potato masher; so continue until berries are used. Cook slowly until currants look white. Strain through a coarse strainer, then allow juice to drop through a double thickness of cheese-cloth or a jelly bag. 2. Measure, bring to boiling-point, and boil five minutes; add an equal measure of heated sugar, boil three minutes, skim, and pour into glasses. Place in a sunny window, and let stand twenty-four hours. Cover, and keep in a cool, dry place. Currant and Raspberry Jelly: Follow recipe for Currant Jelly, using equal parts of currants and raspberries. Blackberry Jelly: Follow recipe for Currant Jelly, using blackberries in place of currants. Raspberry Jelly: Follow recipe for Currant Jelly, using raspberries in place of currants. Raspberry Jelly is the most critical to make, and should not be attempted if fruit is thoroughly ripe, or if it has been long picked. Barberry Jelly: Barberry Jelly is firmer and of better color if made from fruit picked before the frost comes, while some of the berries are still green. Make same as Currant Jelly, allowing one cup water to one peck barberries. Mix rhubarb and sugar. Let set until it forms its own juice. Then boil 10 minutes, stirring often. Add strawberry pie filling. Boil 10 minutes, stirring often. Add strawberry Jello. Cool. Put in jars. Refrigerate. Select sour, smooth-skinned oranges. Weigh oranges, and allow three-fourths their weight in cut sugar. Remove peel from oranges in quarters. Cook peel until soft in enough boiling water to cover; drain, remove white part from peel by scraping it with a spoon. Cut thin yellow rind in strips, using a pair of scissors. This is more quickly accomplished by cutting through two or three pieces at a time. Divide oranges in sections, remove seeds and tough part of the skin. Put into a preserving kettle and heat to boiling-point, add sugar gradually, and cook slowly one hour; add rind, and cook one hour longer. Turn into glasses. Slice nine oranges and six lemons crosswise with a sharp knife as thinly as possible, remove seeds, and put in a preserving kettle with four quarts water. Cover, and let stand thirty-six hours; then boil for two hours, add eight pounds sugar, and boil one hour longer. Remove peel in quarters from eight oranges and prepare as for Orange Marmalade. Divide oranges in sections, remove seeds and tough part of skin. Put into a preserving kettle, add five pounds rhubarb, skinned and cut in one-half inch pieces. Heat to boiling-point, and boil one-half hour; then add four pounds cut sugar and cut rind. Cook slowly two hours. Turn into glasses. 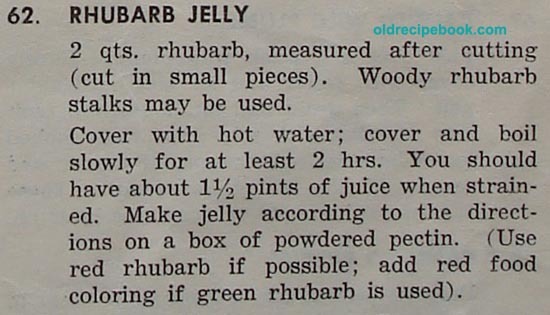 Also see the Rhubarb Recipes page. Wash, seed the cherries and run them through a food grinder. Peel and grind or shred fresh pineapple as cherries. Mix, using 1.4 as much pineapple as cherries. Then add 2/3 as much sugar as there is fruit. Cook until clear and thick, stirring often to prevent burning. Seal.